Surf the Internet. 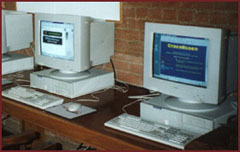 The Internet is an exciting way for people to connect using computers. Browse the World Wide Web. The Rodeo Steakhouse provides internet access and a complete audio/visual solution. Available for groups, private parties, meetings and seminars. Big screen projection. Call for more details.